This comfortable hotel is set in Jimbaran. Those wishing to escape the hustle and bustle of daily routine will find peace and tranquillity at this property. Moreover, there is a wireless Internet connection available on-site. 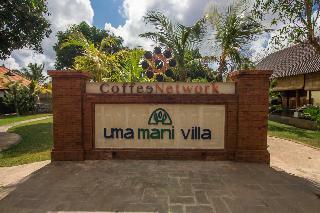 Uma mani Villa and Spa Jimbaran does not offer 24-hour reception. Unfortunately, there are no bedrooms where guests can ask for a cot for the little ones. Uma mani Villa and Spa Jimbaran is not a pet-friendly establishment. There is a car park. The hotel may charge a fee for some services. The Beverly Hills Bali is set in the Jimbaran Hills. 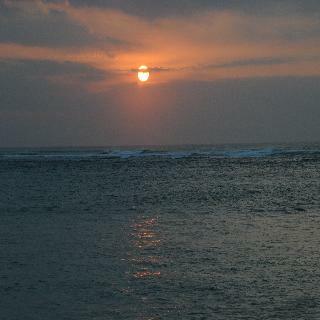 The tourist town of Kuta is a 20 minute drive away while Jimbaran Beach can be reached in 15 minutes. Ngurah Rai International Airport can be reached in 20 minutes. Discover the hillside beauty of Bali from a new luxury private villa complex nestled into the mountains overlooking the Jimbaran Ocean. 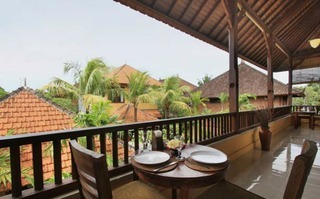 This property has 25 villas designed to suit the needs of all kinds of guests. The site has been carefully chosen to ensure the villas are a haven of tranquillity Each villa has a large garden that features a private swimming pool. Breakfast is served each morning. The restaurant serves Asian specialties, Indonesian and Balinese delicacies and classic European cuisine. 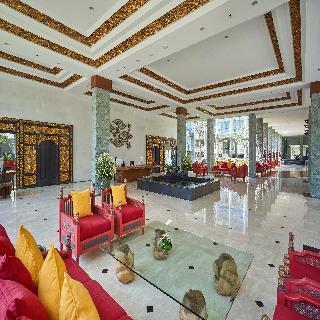 Stay at The Beverly Hills Bali for a truly pleasant and unforgettable experience. Located in the heart of Bali’s popular Jimbaran area, the Best Western Kamala Jimbaran is close to Garuda Wisnu Kencana (GWK) Cultural Park, a short distance from several stunning beaches, and less than a 30 minute drive from the international airport. Featuring 120 contemporary rooms and suites with beautiful views, this modern midscale hotel is deal for travelers wanting to explore the many magical wonders of the “Island of the Gods”. Guests can enjoy authentic Balinese and International cuisine in the hotel’s restaurant, relax in the Lobby Lounge, unwind in the spa and swimming pool, or arrange meaningful events in a choice of three meeting rooms. Romantic evening dinners can also be organized by the poolside. Blending stylish comfort and modern connectivity at a reasonable price, the Best Western Kamala Jimbaran is the perfect choice for your next Balinese adventure. Enjoy your stay! This family-friendly resort is located on the tranquil Jimbaran hilltop with marvellous views over Kuta, Jimbaran and Benoa harbour. It is about a 30-minute drive from Kuta and Bali International Airport.The property has 13 villas, which are located on the idyllic hillside of Ungasan village, set amidst a lush tropical garden and displaying modern Balinese architecture. Offering utter peace and tranquillity, this property is ideal for honeymooners or family holidays. The resort has a lobby with a 24-hour reception and check-out service, and within the resort guests will find a restaurant and hairdressing salon. For guests' comfort and pleasure the resort offers both room and laundry services, as well as bike hire, all for a charge.The villas are decorated in modern Balinese style and have double beds and a balcony or terrace. All villas are fitted with an en suite bathroom with shower, bathtub and hairdryer, as well as individually regulated air conditioning units, direct dial telephone, minibar, safety deposit box and international satellite TV. In the interests of comfort and practicality there are tea and coffee making facilities and an iron and ironing board in each villa.Guests can take a refreshing dip in the resort swimming pool with poolside snack bar and indulge with a massage or beauty treatment (fees apply for treatments).All meals are served á la carte. 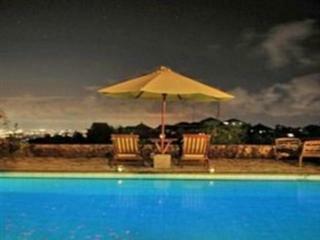 This hotel is located in Ungasan, enjoying 180-degree views of Bali, from the edge of Jimbaran Hill. The hotel affords guests a great setting from which to explore the stunning, natural beauty of the area. 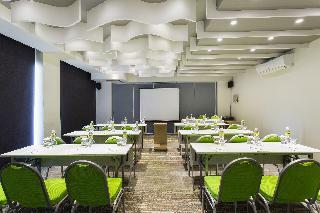 The hotel enjoys a prime setting, lying just a 30 minutes' driving distance from Ngurah Rai International Airport. This wonderful hotel boasts panoramic views over Nusa Penida, Benoa Harbour and the majestic, volcanic mountain range. The guest rooms are luxuriously appointed, featuring a contemporary design, with traditional touches. The rooms are well equipped with modern amenities. Guests are invited to avail of the exemplary facilities and services that the hotel has to offer. Guests can enjoy the utmost in comfort and convenience at this hotel. Umah-D'kampoeng set among the places of interest in Ungasan village in the valey hill of area tourist destination in the southeast area of Bali, presents a much more relaxing atmosphere. All rooms are beautifully appointed and featuring natural interior, delightful custom furniture, and the most exquisite beds to ensure a great night's sleep. 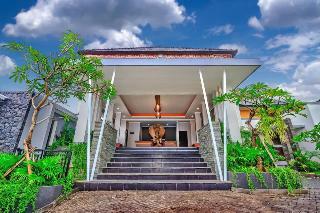 Umah-D'kampoeng is the perfect accommodation to suite your needs for family holiday. 24 unit two bedroom villas(double & twin bed) with living room pacing to the tropical garden inside, dinning corner and pantry, outdoor public swimming pool, restaurant, WiFi, security & CCTV, 24 hours Front Desk, Room Service. Anumana Bay View Jimbaran is a new branded Boutique Hotel which is located near Garuda Wisnu Kencana in Jimbaran. 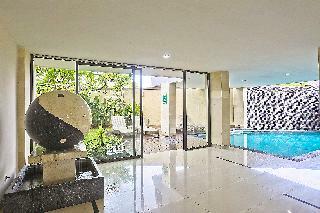 It has 4 floors with 10 rooms, Swimming Pool and Roof Top Café, Lobby and Reception, CCTV. Free WIFI. The Roof Top has 180* splendid Panorama of Benoa Harbor, Bali International Airport and also Jimbaran Bay.The room with 50m2 has living room with two sofa and also private balcony. All rooms equipped with LCD Samsung TV 32inch that has 85 International TV Channel. Private bath room with shower hot and cold water. 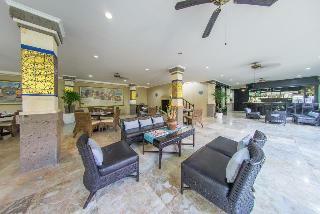 Air Conditioning ,Refrigerator ,Coffee Tea Maker and Safe Deposit Box in each room. KFC , McD , Pepito, Holland Bakery and Pizza Hut Restaurant are very close which is around five minutes by Taxi.